I wrote to Revolution magazine about Cuil recently and they have published an abridged version of my letter in their October edition. 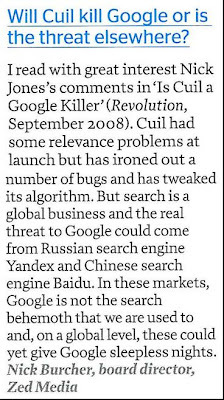 "I read with great interest Nick Jones’s comments in ‘Is Cuil a Google Killer’ (September 1st). Google has unquestionable dominance in the UK market, but the launch of Cuil shows that Search is evolving quickly and Google will need to work hard to keep its position. Cuil had some relevance problems at launch, but has ironed out a number of bugs and tweaked its algorithms over the last month. The results are now more relevant and are offered up nicely, however the hardest thing for Cuil will be to build up its user base. Developments in social search (from engines like Wikia and MSE360) could offer alternatives to searching with the traditional algorithms, but these also have low market shares when compared to Google use. For desktop search, a challenge to Google will only come from a competitor with scale. Search is a global business and the real threat to Google could be from Russian search engine Yandex and Chinese search engine Baidu. In these markets Google is not the search behemoth that we are used to and on a global level Yandex and Baidu could yet give Google sleepless nights. Google would also be wise to continue to invest in mobile where the competition comes from operators as well as other search players. Yahoo! have a well developed mobile proposition and if Google are to consolidate their position as the global leader in search they will need to ensure that their products remain at the forefront of both desktop and mobile search. The only certainty therefore is that Search will continue to evolve. After an incredible 10 years in business Google hold pole position, however against changing internet habits and global consolidation, Google will have to work hard to stay there. The launch of Cuil is a reminder that challenges will continue to come and a reminder that we have by no means reached the Search end game!" Whilst I revel in the thought that the search Goliath of our 21st century - Google, will remain immovable for some years to come, I do find it extremely reassuring that there remains new startups such as Cuil standing up to take up the challenge. As you rightly pointed out, user take up for Cuil will be a challenge. However it can be achieved only if people are willing and open to new experiences. Prime example of how this has been done in the past is the battle between 2 operating systems “Apple vs Microsoft”. Over the decade Apple has “sexed” up its OS as well as its hardware through its relentless new product launches and consumers have lapped this up. Cuil certainly has the capability of changing how we the consumer uses search especially if it’s able to provide the individual with relevant search content. Again, this might not be enough for Cuil to gain its much needed increased user base. They should look to Advertising for this. It’s pretty much how Apple propped up its growth and consumer buy in. Yes, yes, I know, search engines using TV advertising is nothing new given that Google , Yahoo! And ASK have all done it before. But they were pretty much all advertised the same product. This is where I think Cuil could succeed as its different from the norm.